Our most recent small-town adventure took us to one of our favorite weekend getaway destinations: German Village. We came here on a recommendation a few years back and fell in love with it. German Village is a charming little neighborhood just south of downtown Columbus, Ohio. It was first settled by German immigrants in the mid-1800s, and is recognized on the National Register of Historic Places. The village boasts more than 1,600 restored homes and buildings, most of which, along with everything else in the town, is made of bricks. Seriously. The homes are made of brick. The sidewalks and streets are too. The effect is an Old-World feel that contrasts nicely with the town’s more modern, metropolitan surroundings. Along Route 22 in Ohio, we stop at a place called Antiques & Junque, housed in an ancient barn that looked like it could topple over at any minute. After searching in vain for any old typewriters, I purchase an “Annie” glass for my daughter and an E.T. figurine for my son. It’s always smart to return with presents. That way the kids won’t care when you go away again. 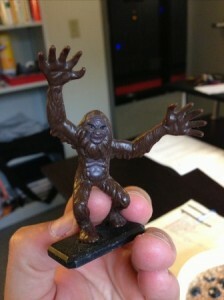 I also picked up a little Bigfoot for me. At the Columbus Brewing Co., Mara somehow gets lost on her way back from the restroom and ends up in the parking lot. She then tries to purchase a gift certificate for her friend, who may or may not be coming to the brewery sometime in the next week, and who, by the way, is also pregnant. She then decides otherwise. That afternoon we attend the Crew vs. Timbers game on a perfect summer evening. I enjoy two glasses of Guinness while taking in the soccer match. Heaven. 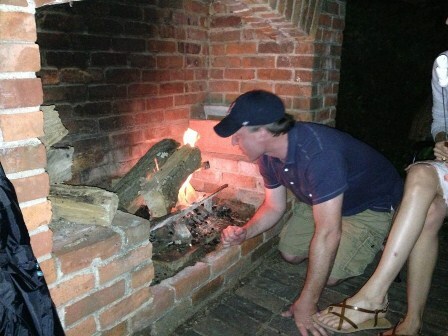 After going on a wild goose chase for pizza around German Village, we finally settle on a pie from a local pub and adjourn to the incredible German Village Guesthouse, where we enjoy our pizza and wine out back, fireside. 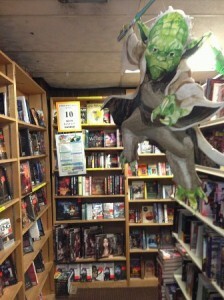 37 rooms of books AND a flying Yoda – What’s not to like? After breakfast at the guesthouse, we walk to The Book Loft – the coolest bookstore ever – where we spend the next 2.5 hours perusing the 37 – YES, 37! – rooms of books. While there, I am permitted to use the bathroom by the same employee who inexplicably denies the same right to Mara and then a pregnant woman. (Bizarre.) After paying for my books, I go outside to wait for my wife and friends who tell me they’ll be “right out.” A half hour later, I find them inside hanging out and having a grand old time without me. Hungry-Tired Val, a close relative of the Incredible Hulk, is displeased. After finally leaving the book store, we head up to the Short North area and walk around, desperately trying to find a place to eat lunch, even though it’s well after 2 p.m. Cassie says she’d like to find an “American food place,” and then chooses an eatery called Haiku – Food and Poetry. (?) Mara turns down several viable options: one because it’s “too dark”; another because it has “bad chairs”; and yet another because it “smells like vintage clothing.” By this time Hungry-Tired Val is losing patience and fading fast. We finally settle on a place called Union Cafe, a gay bar that serves killer burgers and something called a “Flirtini.” Luckily they had decent lighting and comfy seating, and the place didn’t smell like a thrift shop. And so our German Village/Columbus adventure came to a close. I’m sure we’ll be back again soon. Only next time I’m brown-baggin’ it, just in case. 4 Responses to "Small-Town Adventures – German Village (Columbus, OH)"
Congratulations on your Studio 45. That was one fantastic price for a very nice looking typewriter. Typing books are nice to have. I’ve managed to add a few to my typewriter collection. I’m glad to hear everyone had fun in German Village. It’s one of my favorite places in Columbus. The Book Loft is an experience every book lover (or even liker) should have at least once. If you haven’t already, try to go back in December. Everyone decorates with white lights (which I prefer) and it feels like you walked into a old Christmas card. Will do, Erik! Thanks for the tip. Such a lovely town. Small-Town Adventures – Lewiston, N.Y.